WSU’s 2017 difference maker: Tavares Martin Jr.
PULLMAN – There’s a baseball coach in Logan, Utah, who probably does not have the slightest clue how his words fueled one of the top quarterbacks in college football. 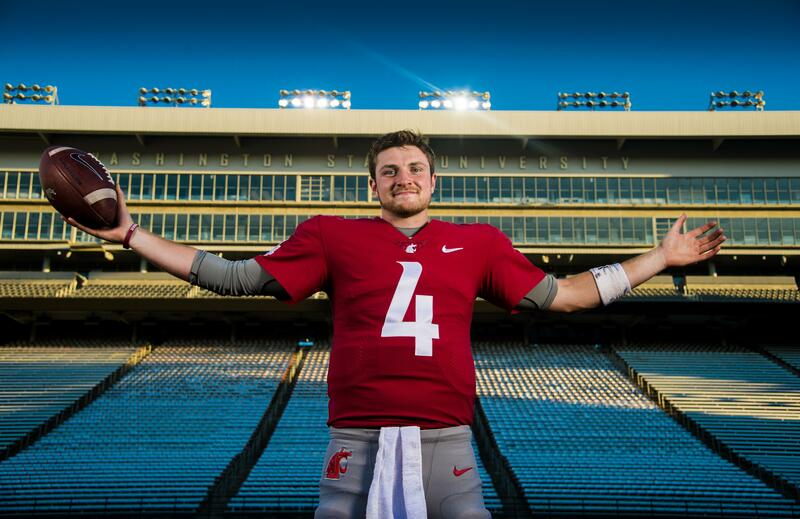 By now, Luke Falk, the former Washington State walk-on whose college scholarship offers were somewhere between zero and zilch, has more bulletin-board material than he knows what do to with. Enough to fill a novel, probably. But this specific anecdote is worth mentioning because, well, Falk felt it was worth sharing. Eight years ago, he was a starting pitcher for the freshman team at Logan High. Falk could place the ball in the strike zone with consistency, but the numbers on the radar gun were nothing to write home about, and besides, he’d already mapped out a path to college in another sport. This is where the skeptic comes in. Later on, Falk recants. Now that he thinks about, HE was the one who asked the question and HE was the one who was bluntly told he couldn’t make it as a top-tier football player. It cut deep. By Falk’s request, the baseball coach will remain anonymous and it’s probably best to spare him of the embarrassment anyway. The teenage boy he once doubted is now the top active passer in the NCAA and approximately four quarters shy of becoming the most productive quarterback in school history. With only 420 yards, he’ll leap his WSU mentor, Connor Halliday. With 2,713, he’ll move past Sean Mannion and become the Pac-12’s all-time leader. With 4,144 passing yards – he had 4,468 last season and 4,500-plus the year before, just to show how manageable it is – Falk will join only five other players in the history of the college game who’ve thrown for 15,000 yards or more. Not that he minds giving up a headline or two, but Falk will have to share some of his spotlight with three other elite gunslingers out west this season. It’s by no means the inaugural Year of the Quarterback in the Pac-12, but the left coast is especially littered with talent in 2017. Down south, the headliners are USC’s Sam Darnold and UCLA’s Josh Rosen, while UW’s Jake Browning and WSU’s Falk battle for supremacy up north. 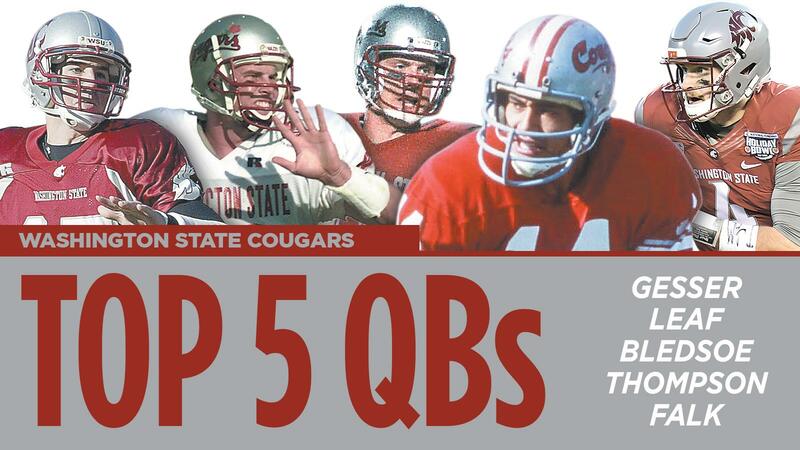 All four have glowing golden arms that will someday yield NFL paychecks, but at least one slightly biased party in Pullman thinks his guy is a notch above the other three. And the numbers back that up. Of that quartet, Falk was the leader in attempts (633), completions (433) and yards (4,468) last season, but more impressive than the raw numbers was the precision. Falk tried more passes than anyone in the country, but only one other quarterback – Oklahoma stud Baker Mayfield – hit them at a higher completion percentage. Mayfield’s clip was 71 percent, Falk’s was 70. A team of Pac-12 Networks analysts recently stopped in Pullman during a preseason tour of the conference. It’s their job to survey all 12 teams from top to bottom and understandably, their eyes are drifting over to the quarterback more this fall than any other. The verdict on Falk? Believe it or not, there are still Falk cynics out there. Really, Falk is just grateful to be in this spot, at the wheel of an offensive system that seems to fit him to a T.
You see, as a growing boy in Logan, he was a gamer. A video-gamer, to be specific, though the other interpretation of “gamer” would fit his persona quite nicely, too. He’d play the now-extinct EA Sports NCAA football game and Texas Tech was a common stopping place while he was scrolling through a list of teams to use. Tech of course is where Leach popularized the Air Raid offense, years after Hal Mumme laid the ground roots in Lexington, Kentucky. Harrell, who’d later become a tutor of Falk’s at WSU, threw for nearly 15,800 yards over the course of his career and took down a bundle of NCAA records along the way. In Logan, young quarterbacks were already learning the basics of a spread offense that wasn’t identical to the Red Raider Air Raid, per se, but shared many of the core concepts. Reading the box, determining defensive numbers and making checks at the line of scrimmage were all things Falk had mastered by the time he reached high school. 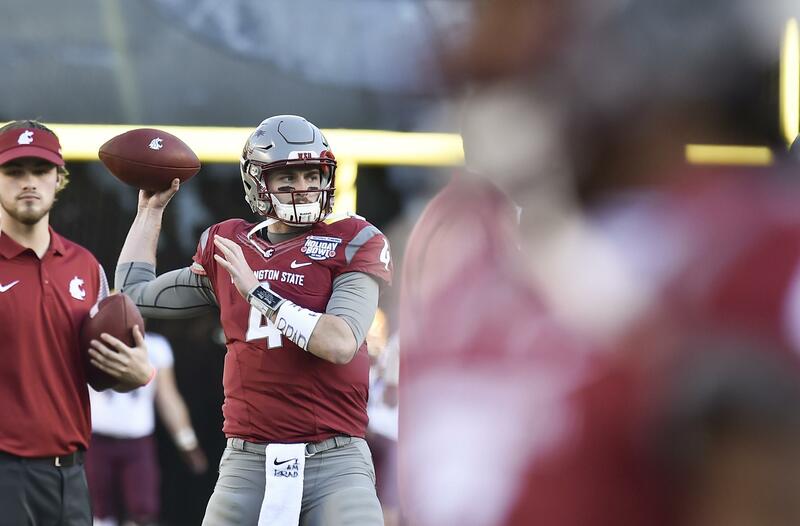 At this point, Falk had already passed on every other sport – “Originally, I thought I was going to be an NBA star,” he quipped – and determined his only route to college was via football, and more specifically, quarterback. Favero’s offense, similar to Leach’s, gave Falk full autonomy. As long as the quarterback followed Favero’s basic criteria, he essentially held the clout of an offensive coordinator. But Favero also felt it was crucial for Falk to understand how opponents were game-planning against him – he needed to see the field through the eyes of a defensive coordinator. “We spent a lot of time in the film room teaching him how to be a defensive coordinator,” Favero said. Logan’s high-volume passing offense demanded a lot of Falk’s throwing arm. In one game, he attempted a Utah state record 70 passes – and that was in the middle of a blizzard, when it might have been most sensible to keep the rock on the ground. Nope. Falk’s darts cut through the chilly air and the quarterback ultimately led his side to a 28-10 victory over Box Elder. Five years later, Falk still owns Utah High School Athletic Association records for single-season completions (330) and attempts (562). After a 15-minute interview with Favero, you’d be convinced that Falk is prepared to take the reins of any NFL franchise and transform them into a playoff contender. The ex-Logan coach has already dropped Peyton Manning’s name while gushing about his player – guess who’s next? Now, this could just be a high school coach gloating about his most successful project, but Favero’s credentials would tend to tell you otherwise. In 17 years, he amassed 149 wins and won five state championships while taking home five UFCA coach of the year honors. He’s had wild success at the quarterback position and was one of the first Logan-area coaches to dabble in the spread offense. All successful NFL quarterbacks, Favero believes, need to be competent in four categories: mental toughness, accuracy, the ability to process information in a nanosecond and leadership. Falk bats 4-for-4 in those areas. As a high school sophomore, Falk jotted down every one of Logan’s offensive concepts, schemes and plays, then matched each of them with every single defensive coverage the Grizzlies could face. It amounted to hours of homework – just to ensure he was ready for every package the opponent could roll out. So, to refresh: one of those coaches in Utah thought Falk couldn’t make it as a college football player. The other predicts he’ll have a long and fruitful career in professional football. Falk, who’s fully embraced Leach’s tagline of “play the next play,” is only concerned with what’s happening this fall for No. 24 Washington State. The senior has an opportunity to become the only quarterback in school history to guide the Cougars to three consecutive bowl games. But when he finally does leave, the contrasting messages he received from two coaches in Logan will surely stick with him – one who thought he could and one who thought he couldn’t.